52. Gershwin, L. & Zeidler, W. (2011 In Press). Preliminary studies of the jellyfish fauna of Tasmanian waters, with comments on pelagic endemicity and species introductions. Records of the Queen Victoria Museum and Art Gallery. 51. Bridgewater, F., Gershwin, L. & Tibballs, J. (2011 In Review). A critical review of the role of hot water in the first aid management of jellyfish stings (Cnidaria: Cubozoa; Scyphozoa; Hydrozoa: Siphonophora). Toxicon. 50. Gershwin, L. (2011 In Review). Identifying Cubozoa (Phylum Cnidaria). Zootaxa. 49. Gershwin, L. (2011 In Review). Revision of the family Tamoyidae (Cnidaria: Cubozoa). Zootaxa. 48. Gershwin, L. (2011 In Review). Some new medusa species from the Ronald J. Larson collection of the National Museum of Natural History, Smithsonian Institution. Zootaxa. 47. Gershwin, L. & Cairns, S. D. (2011 In Review). Catalogue of medusa and ctenophore type specimens in the National Museum of Natural History, Smithsonian Institution. Zootaxa. 46. Gershwin, L. & Gordon, D. (2011 In Review). Jellyfishes of New Zealand (Cnidaria: Scyphozoa, Cubozoa, Staurozoa). Zootaxa. 45. Neethling, S., A. Channing, L. Gershwin, et al. (2011). A modern description of Crambionella stuhlmanni (Scyphozoa: Rhizostomeae) from St Lucia Estuary, South Africa. Journal of the Marine Biological Association of the United Kingdom 91(Special Issue 02): 357 -367. 44. Li, R., C. E. Wright, K. D. Winkel, L. Gershwin, et al. (2011). The pharmacology of Malo maxima jellyfish venom extract in isolated cardiovascular tissues: A probable cause of the Irukandji syndrome in Western Australia. Toxicology Letters 201: 221-229. 43. Lippmann, J. M., P. J. Fenner, K. Winkel, & L. Gershwin. (2011). Fatal and Severe Box Jellyfish Stings, Including Irukandji Stings, in Malaysia, 2000–2010. Journal of Travel Medicine 2011: 1-7. 42. Romero, A., Rogers, R.R., & Gershwin, L. (2011). Medusoid Cnidarians from the Montral-Alcover Lagerstatten (Ladinian, Middle Triassic), Northeastern Spain. Batalleria 16: 50-57. Marine Biological Workshop, the Marine Fauna and Flora of Moreton Bay, Queensland. Memoirs of the Queensland Museum 54(3): 47–108. 40. Gershwin, L., Zeidler, W. & Davie, P.J.F. (2010). Ctenophora of Australia. In, Davie, P.J.F. & Phillips, J.A. (Eds), Proceedings of the Thirteenth International Marine Biological Workshop, the Marine Fauna and Flora of Moreton Bay, Queensland. Memoirs of the Queensland Museum 54(3): 1–45. 39. Galil, B. & Gershwin, L., et al. (2010). Marivagia stellata gen. et sp. nov., a spectacular new genus and species of jellyfish (Cnidaria: Scyphozoa: Rhizostomeae) from the eastern Mediterranean. Aquatic Invasions. 5(4): 331–340. 38. Gershwin, L. & Zeidler, W. (2010) Csiromedusa medeopolis: a remarkable Tasmanian medusa (Cnidaria: Hydrozoa: Narcomedusae) comprising a new family, genus and species. Zootaxa, 2439: 24-34. 37. Fenner, P., Lippmann, J. & Gershwin, L. (2010). Fatal and non-fatal severe jellyfish stings in Thai waters. Journal of Travel Medicine 2010: 1-6. 36. Cairns, S.D., Gershwin, L., et al. (2009) Phylum Cnidaria: Corals, medusae, hydroids, myxozoans. In: Gordon, D.P. (Ed.) The New Zealand Inventory of Biodiversity. Volume 1. Kingdom Animalia: Radiata, Lophotrochozoa, Deuterostomia. Canterbury University Press: Christchurch, pp. 59-101. 35. Gershwin, L. & Dabinett, K. (2009) Comparison of eight types of protective clothing against Irukandji jellyfish stings. Journal of Coastal Research, 25(1): 117-130. 34. Gershwin, L. & Gibbons, M. J. (2009). Carybdea branchi, sp. nov., a new box jellyfish (Cnidaria: Cubozoa) from South Africa. Zootaxa 2088: 41-50. 33. Gershwin, L., De Nardi, M., Fenner, P. J. & Winkel, K. D. (2009) Marine Stingers: Review of an under-recognized global coastal management issue. Journal of Coastal Management, 38(1): 22-41. 32. Gershwin, L. (2008) Morbakka fenneri: a new genus and species of Irukandji jellyfish. Queensland Museum Memoirs, 54(1): 23-33. 31. Gershwin, L. & Dawes, P. (2008) Preliminary observations on the response of Chironex fleckeri (Cnidaria: Cubozoa: Chirodropida) to different colors of light. Biological Bulletin (Woods Hole), 215: 57-62. 30. Gershwin, L. & Kingsford, M. J. (2008). Pelagic Cnidaria and Ctenophora. The Great Barrier Reef: Biology, environment, and management. P. Hutchings, M. J. Kingsford and O. Hoegh-Guldberg: 188-198. 29. Gershwin, L. & Zeidler, W. (2008a) Some new and previously unrecorded Scyphomedusae (Cnidaria: Scyphozoa) from southern Australian coastal waters. Zootaxa, 1744, 1-18. 28. Gershwin, L. & Zeidler, W. (2008b) Two new jellyfishes (Cnidaria: Scyphozoa) from tropical Australian waters. Zootaxa, 1764, 41-52. 27. Gershwin, L. & Zeidler, W. (2008c) Cladonema timmsii, a new species of hydromedusa (Cnidaria: Hydrozoa) from a salt lake in South Australia. Zootaxa, 1826: 59-68. 26. Gershwin, L. (2007) Malo kingi: A new species of Irukandji jellyfish (Cnidaria: Cubozoa: Carybdeida), possibly lethal to humans. Zootaxa, 1659, 55-68. 25. Gershwin, L. (2006a) Comments on Chiropsalmus (Cnidaria: Cubozoa: Chirodropida): a preliminary revision of the Chiropsalmidae, with descriptions of two new species. Zootaxa, 1231, 1-42. 24. Gershwin, L. (2006b) Nematocysts of the Cubozoa. Zootaxa, 1232, 1-57. 23. Gershwin, L. (2006c) Jellyfish responsible for Irukandji syndrome. Quart. J. Med., 99, 801-802. 22. Gershwin, L. (2006d) Aldersladia magnificus: a new genus and species of Hydromedusae (Cnidaria: Hydrozoa: Leptomedusae: Aequoreidae) from tropical and subtropical Australia. The Beagle, 22, 9-13. 21. Gershwin, L. & Alderslade, P. (2006) Chiropsella bart, n. sp., a new box jellyfish (Cnidaria: Cubozoa: Chirodropida) from the Northern Territory, Australia. The Beagle, 22, 15-21. 20. Gershwin, L. (2005a) Spectacularia vanoppenae gen. et sp. nov., a new hydromedusa (Cnidaria: Hydrozoa: Dipleurosomatidae) from the Great Barrier Reef. Memoirs of the Queensland Museum, 50, 201-205. 19. Gershwin, L. (2005b) Two new species of jellyfishes (Cnidaria: Cubozoa: Carybdeida) from tropical Western Australia, presumed to cause Irukandji Syndrome. Zootaxa, 1084, 1–30. 18. Gershwin, L. (2005c) Carybdea alata auct. and Manokia stiasnyi, reclassification to a new family with description of a new genus and two new species. Memoirs of the Queensland Museum, 51, 501–523. 17. Gershwin, L. & Alderslade, P. (2005) A new genus and species of box jellyfish (Cubozoa: Carybdeida) from tropical Australian waters. The Beagle, 21, 27–36. 16. Winkel, K.D., Tibballs, J., Molenaar, P., Lambert, G., Coles, P., Ross-Smith, M., Wiltshire, C., Fenner, P.J., Gershwin, L., Hawdon, G.M., Wright, C.E. & Angus, J.A. (2005) The cardiovascular actions of the venom from the Irukandji (Carukia barnesi) jellyfish: effects in human, rat and guinea pig tissues in vitro, and in pigs in vivo. Clinical and Experimental Pharmacology and Physiology, 32, 777-788. 15. Goggin, L., Gershwin, L., Fenner, P., Seymour, J. & Carrette, T. (2004). Stinging jellyfish in tropical Australia. Current State of Knowledge. Townsville, Queensland, CRC Reef Research Centre: 6 pp. 14. Silberman, J.D., Collins, A.G., Gershwin, L., Johnson, P.J. & Roger, A.J. (2004) Elliobiopsids of the genus Thalassomyces are Alveolates. Journal of Eukaryotic Microbiology, 51, 246-252. 13. Zeidler, W. & Gershwin, L. (2004) A new species of Australomedusa (Cnidaria: Hydrozoa: Anthomedusae) from a saline lake in south-western Western Australia. Records of the Western Australian Museum, 22, 109–113. 12. Gershwin, L. (2003) Scyphozoa and Cubozoa of Guam. Micronesica, 35, 156-158. 11. 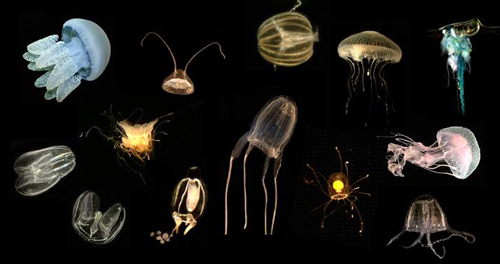 Gershwin, L. & Zeidler, W. (2003) Encounter 2002 expedition to the Isles of St Francis, South Australia: Medusae, siphonophores and ctenophores of the Nuyts Archipelago. Transactions of the Royal Society of South Australia, 127, 205-241, 14 plates. 9. Gershwin, L. & Collins, A.G. (2002) A preliminary phylogeny of Pelagiidae (Cnidaria, Scyphozoa), with new observations of Chrysaora colorata comb. nov. Journal of Natural History, 36, 127-148. Supplemental data archived at: http://www.ucmp.berkeley.edu/archdata/Gershwin_Collins/. 8. Gershwin, L. (2001) Systematics and biogeography of the jellyfish Aurelia labiata (Cnidaria: Scyphozoa). Biological Bulletin (Woods Hole), 201, 104-119. 7. Gershwin, L. & Lipps, J. H. (2001). Some new thoughts on some old animals. American Zoologist 41(6): 1452-1453. 5. Radwan, F.F.Y., Gershwin, L. & Burnett, J.W. (2000) Toxinological studies on the nematocyst venom of Chrysaora achlyos. Toxicon, 38, 1581-1591. 4. Rees, J.T. & Gershwin, L. (2000) Non-indigenous hydromedusae in California's upper San Francisco Estuary: Life cycles, distribution, and potential environmental impacts. Scientia Marina, 64, 73-86. 3. Gershwin, L. (1999) Clonal and population variation in jellyfish symmetry. Journal of the Marine Biological Association of the United Kingdom, 79, 993-1000. 2. Kouchinsky, A., Bengtson, S. & Gershwin, L. (1999) Cnidarian-like embryos associated with the first shelly fossils in Siberia. Geology, 27, 609-612. 1. Martin, J.W., Gershwin, L., Burnett, J.W., Cargo, D.G. & Bloom, D.A. (1997) Chrysaora achlyos, a remarkable new species of scyphozoan from the eastern Pacific. Biological Bulletin (Woods Hole), 193, 8-13.